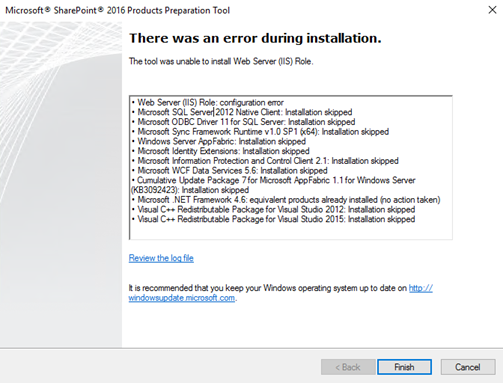 While I was doing a SharePoint 2016 install at a customer, I got hit by the The tool was unable to install Web Server (IIS) Role error when trying to install the SharePoint 2016 prerequisites on a Windows Server 2016. I know back in SharePoint 2013 this happened a lot, and there was a support article for it called The Products Preparation Tool in SharePoint Server 2013 may not progress past “Configuring Application Server Role, Web Server (IIS) Role”. 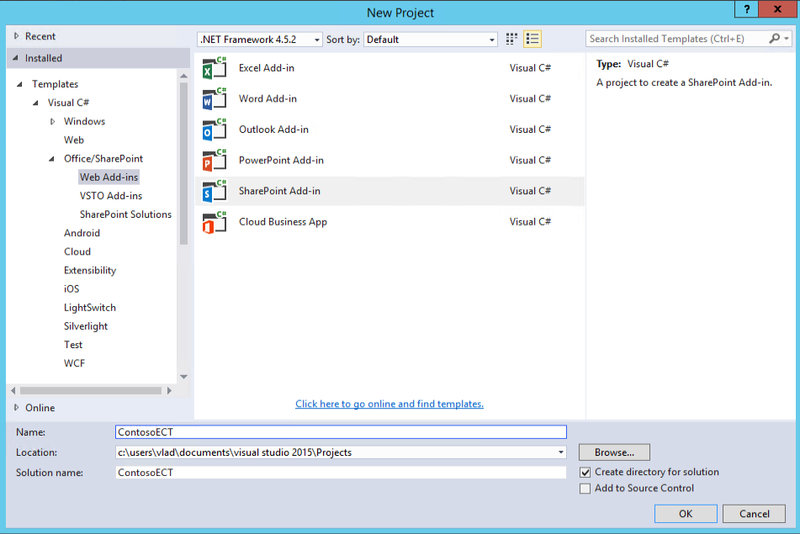 This article gave us the following PowerShell cmdlets to run, that would basically install some of the features and roles that SharePoint Needs. 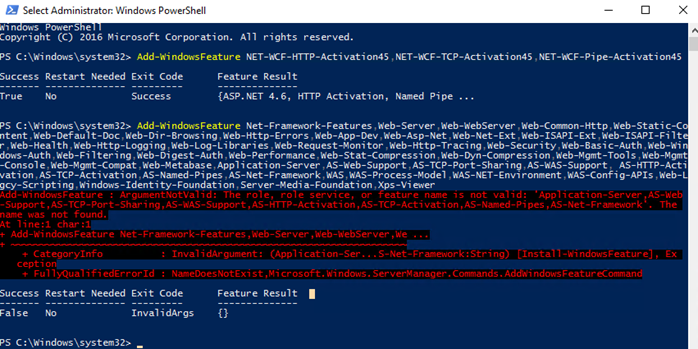 When trying to run this on Windows Server 2016, we get this error: Add-WindowsFeature : ArgumentNotValid: The role, role service, or feature name is not valid: ‘Application-Server,AS-Web-Support,AS-TCP-Port-Sharing,AS-WAS-Support,AS-HTTP-Activation,AS-TCP-Activation,AS-Named-Pipes,AS-Net-Framework’. The name was not found. And make sure to replace the D:\sources\sxs to the actual path of your sources file. The sources file is on your Windows Server 2016 installation media, and you need to specify it and have it mounted on your computer (or copied somewhere) for the prerequisite install to work properly! Everything should work properly afterwards to run the prerequisite installer! In theory, a reboot is not needed, but I always prefer to do one after activating that many features just in case! Microsoft just published a new support article stating that you cannot use calculated fields to display HTML anymore. I know a lot of people were using this to for example show KPIs, or do some conditional formatting. This change was announced on June 13th 2017 and taking effect as of June 13th 2017 , so not giving companies a lot of time before things start breaking … however an Administrator can open a support ticket and extend this functionality until September 10th , when this will completely stop working. In Microsoft SharePoint lists and libraries, calculated fields that are running in the classic UI mode can be used to display results based on Excel-like formulas. This is a long standing capability, and is documented in Calculate data in lists or libraries. We are changing calculated fields to escape special characters. In some circumstances, this mean that calculated fields that contain any unsupported markup will not display any value. Instead, they’ll be blank in the list view. This change will take effect on June 13, 2017. Administrators can request an extension through September 10, 2017 at the latest. During this time, special characters will not be escaped in calculated fields. This request can be submitted through Microsoft Support. However, beginning September 10, 2017, all unsupported markup will be ignored. The June 2017 Public Update (PU), and subsequent PUs will include a new web application setting that’s called CustomMarkupInCalculatedFieldDisabled. 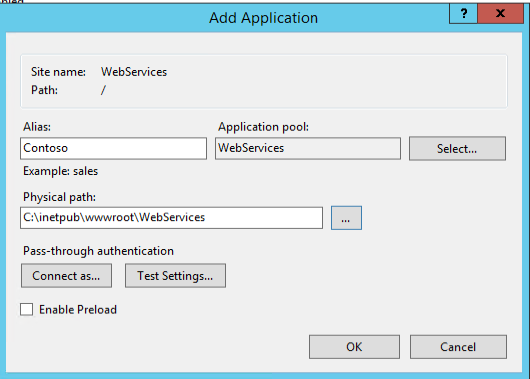 This setting will enable an on-premises administrator to configure whether or not calculated fields in a given web application will escape special characters. Here’s the default behavior for existing and new web applications at the time of the update installation. You can also view it on Microsoft Support Here: Handling HTML markup in SharePoint calculated fields. Does this change affect you or your users? How do you plan to go around it for those different needs? Will you be requesting an extension until September 10th? Share the info the comments so we can all help each other and make sure to share this on Social Media so your colleagues will also be aware of the change! After a popular session at Collab365 Conference last week where Microsoft Learning talked about the SharePoint 2016 exams, they finally released the information on their site as well. The exam number is 70-339 and is called Managing Microsoft SharePoint Server 2016. According to the Collab365 Conference session, the 70-339 exam will be the only SharePoint exam required for the SharePoint 2016 MCSE certification. The date on the Microsoft learning site for the exam release is June 20th, so in a bit more than a month. To view more information about the exam from the Microsoft Learning site, check out the exam here: https://www.microsoft.com/en-us/learning/exam-70-339.aspx . I know the exam is still under development and the description might change, but as I am reading the exam objectives, there are a lot of strange descriptions. Let’s look at the Exam Objectives in detail. Those are my personal opinions and the bullets will start with “Vlad: “. Feel free to give me your opinions on the exam , or on my opinions in the comments. Vlad: Glad to see that planning the Sensitive and non-sensitive information, especially that DLP is only mapped per site collection, so that certainly makes sense. Durable Links is also mentioned, although I don’t see what you can plan for it, except use it or not use it. Also, I never heard about document fingerprinting and Item-level encryption in SharePoint before. Something I will have to read more on. Vlad: The first phrase confuses me; how can I plan a traditional topology by using MinRole? It should read (Traditional, streamlined, MinRole), and then it should maybe have talked about On-Premises and Hybrid. Vlad: Not sure what “Managed Paths for Office 365 Migrations” is. 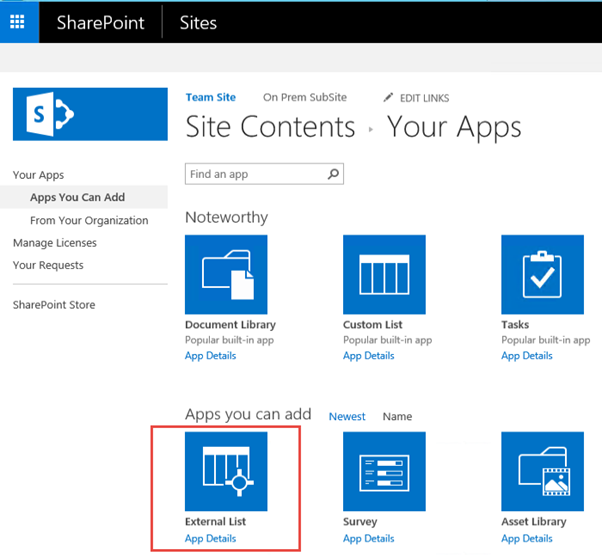 Should we only use the two Office 365 Managed Paths (/sites, /teams) On-Premises as well? Also, what can we track and audit in the install? 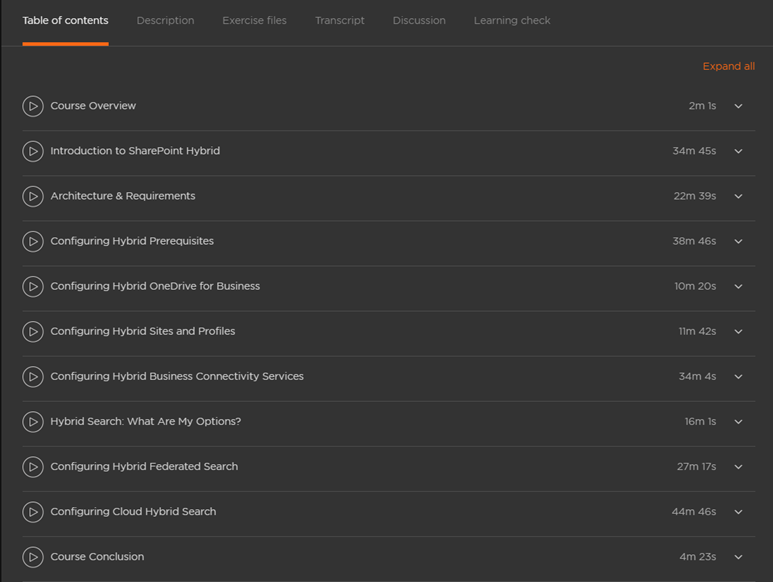 Vlad: Why is Office Online in the Hybrid cloud? Already that Microsoft confused a lot of clients because Office Online Server, is on-premises, but clients think that it’s in Office 365 only. By putting it in the “Hybrid Cloud” category, it will confuse people even more. Vlad: One Click Share is a permission nightmare. Vlad: Happy to see Azure here for DR, but wonder what the “Other Azure Backup solutions” are. Vlad: OneDrive redirection and Yammer should be in Hybrid, not here. Vlad: How can we configure Software boundaries J ? 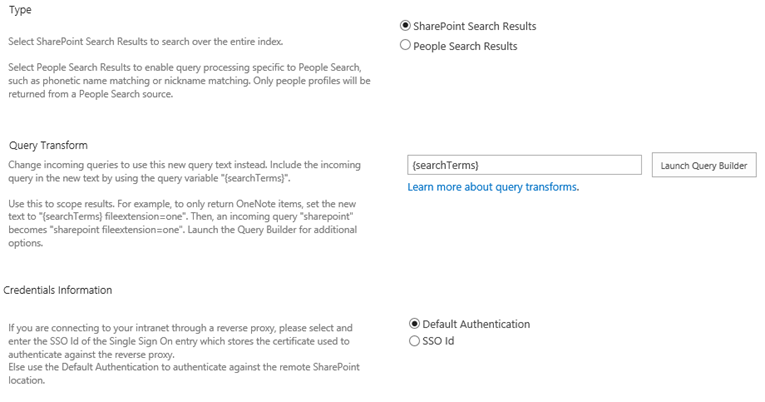 Also there is nothing to configure with Durable Links… everything is done when connecting Office Online Server to SharePoint. Vlad: Plan Remove of servers in rotation, I hope it’s from the NLB and not the farm. 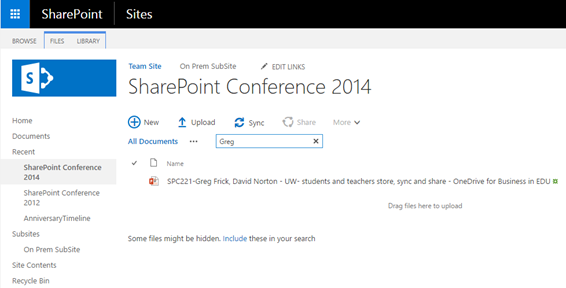 Wonder what they will cover in the migrating to SharePoint Online… how to use a third party? The FastTrack isn’t anything technical, so doubt it will be covered, and the PowerShell cmdlets are still very basic. Vlad: Aren’t those Add-ins now J? Vlad: Office online Server again, didn’t we already plan and configure for it 3x? J. Also, a lot of Hybrid here again… and Office Online Server in the middle of hybrid features, even if it has nothing to do with Hybrid. SharePoint Insights isn’t even yet released in beta, so hopefully no questions on it at launch and… “SharePoint Server Telemetry features”. That’s something I never heard off before, so maybe this is a leak of an upcoming feature in the first Feature Pack? Who knows… but hopefully they won’t test on it June 20th. Vlad: Hybrid BCS is a different beast than BCS… wonder why this is here and not in the hybrid section. 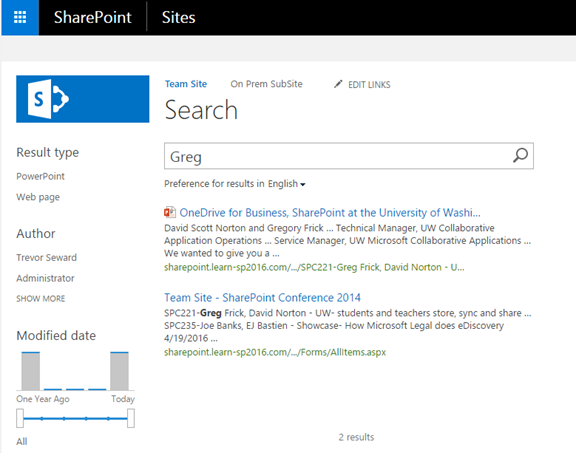 Vlad: Delve + Office Graph don’t work with Federated Search. 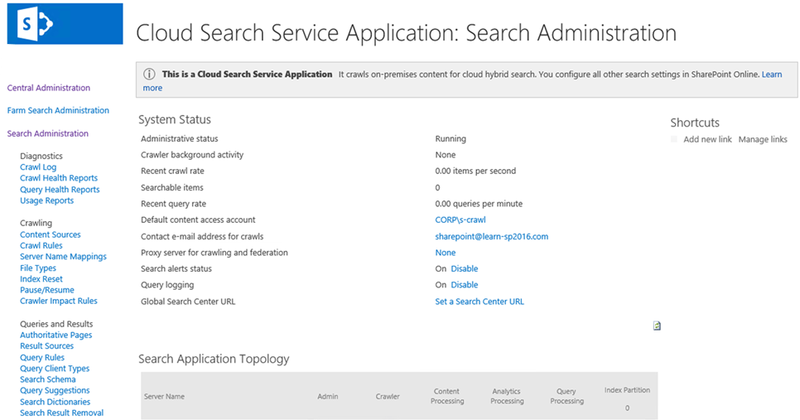 Hope they mean Cloud Hybrid Search. Vlad: Again a comment about Office Online + BI being in Hybrid. Why is BI in the Cloud Services Category, when Office Online Server has NOTHING to do with Office 365? Again more confusion to make clients think that Office Online Server is not on-premises. Vlad: Why is this in the Cloud Services section? Project Server 2016 is on Premises, as well as Exchange 2016. Vlad: You can’t really configure Zero Down Time Patching (ZDT). You can plan for it, you can plan your upgrade sequence, but there is nothing to configure for ZDT. What do you think about the exam contents? Anything missing, anything that shouldn’t be there? Should this have been two different exams? One for On-Prem and one for Hybrid? Let me know in the comments! 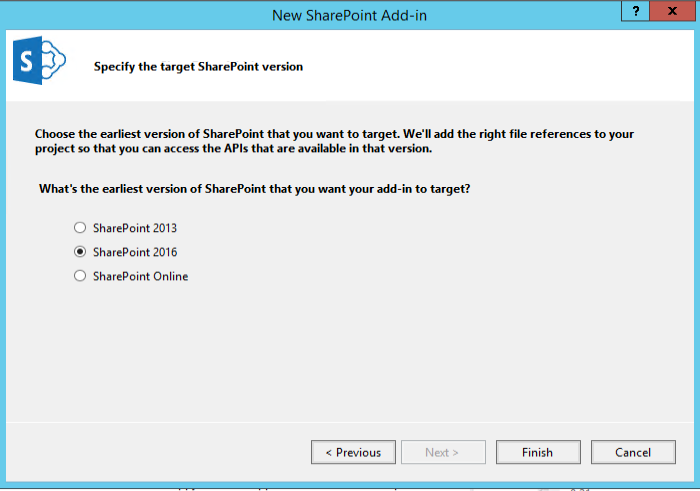 A few weeks ago, I started playing with Hybrid SharePoint Server 2016 scenarios, to see if there are any differences with SharePoint 2013. As I am mostly an IT Pro, usually I never did the OData Source myself, but had a developer set that up for me. This time, I was in my lab, and I was both the DEV and the SharePoint Admin that had to do the IT part. (Talk about DevOps). 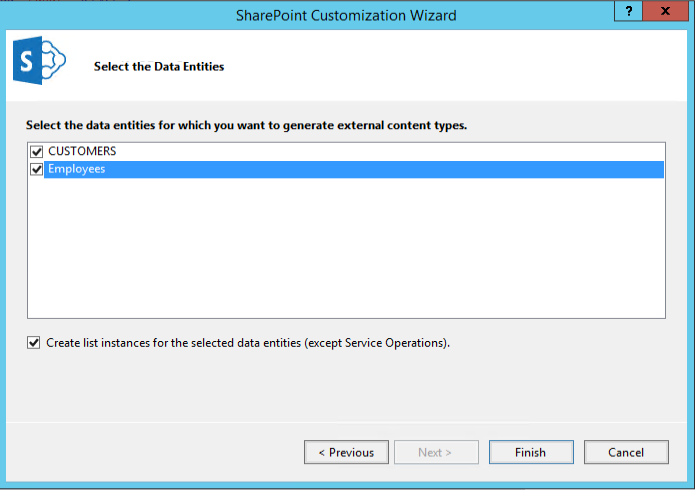 That and the fact that I had quite a lot of problems with getting it to work with Entity Framework 6, I decided to do a blog post for all the SharePoint Admins and Developers out there that want to create a SharePoint 2016 External Content Type with an OData Source. This blog will really be a step by step that everyone could follow, so if you are a more experienced dev, you can probably skip most of the screenshots, but I am sure that if you’re an IT Pro and first time doing this, you will find it valuable. 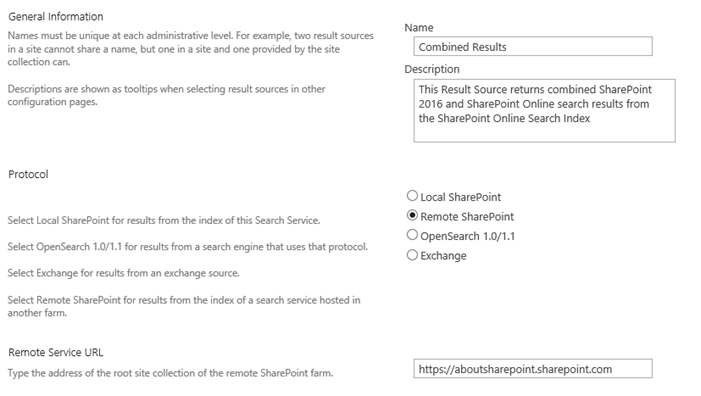 Our Goal for this blog post is to get the following table, in SharePoint Server 2016. 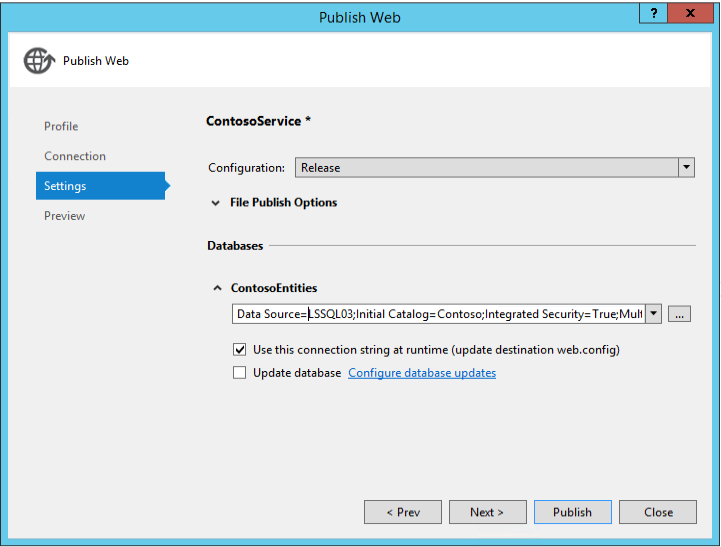 The Hybrid configuration will be done in another blog post, for this one, we simply want to make it work in SharePoint 2016 On-Premises. 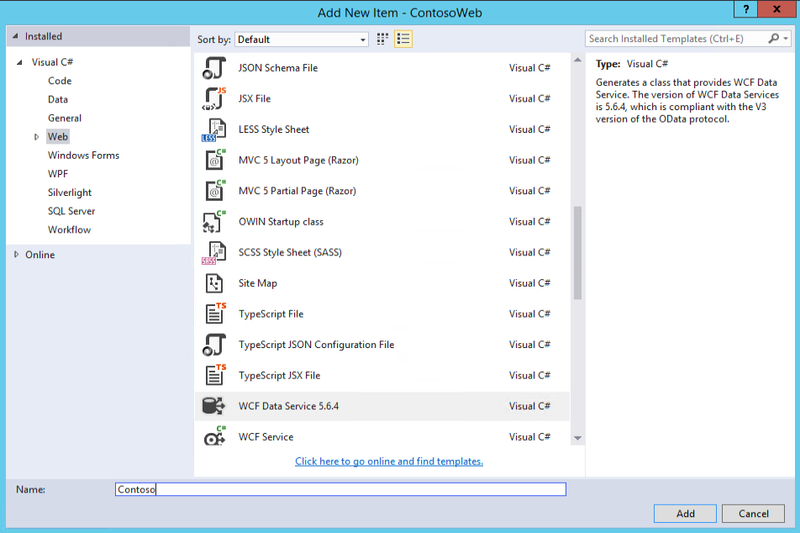 You will need to have access to a SharePoint Development machine with Visual Studio, as well as a IIS server where you can deploy your WebService at after (This can be done on the SharePoint Server). Note, and this one is especially for people (like me) who will simply do this for testing. You need to have a Primary Key in your table for this to work. Without a Primary Key, you will get strange errors. For production, I hope this will not be a problem, but if you create a quick Database for testing, make sure your table has a PK defined. 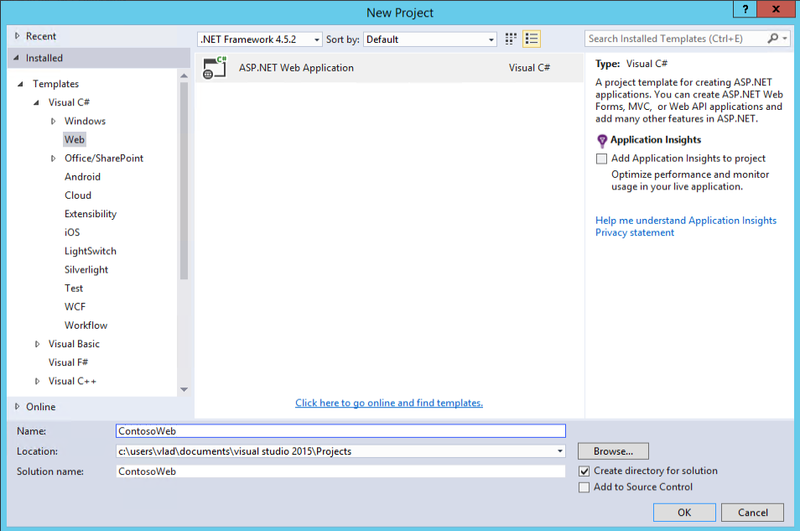 Create a new Project of type ASP.NET Web Application and name it as you wish. 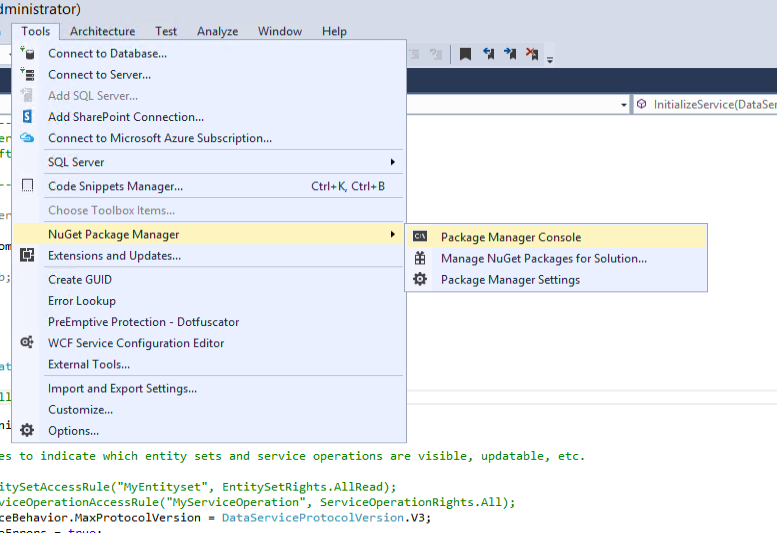 (For this scenario, we disabled the checkbox for Application Insights , since we don’t want to use /configure it). In the next page, select Empty, since we want an Empty Web Application where we will add our own stuff. Now, we will need to start adding items in this Project, so right click on the project name, Add, and Add New Item. 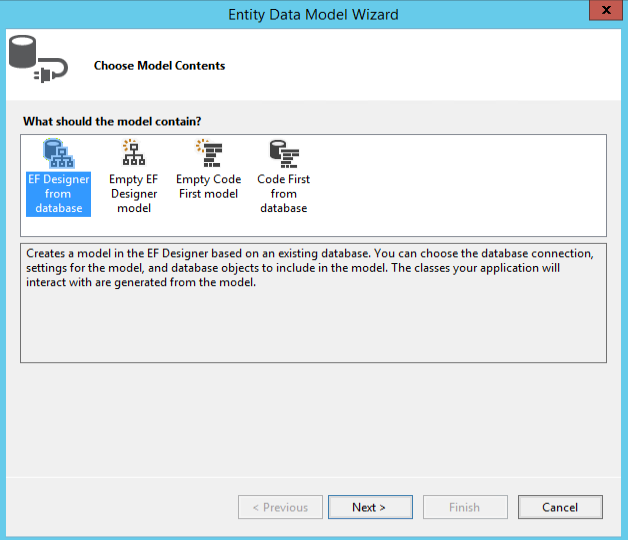 In the Entity Data Model Wizard, choose EF Designer from Database. Enter the Connection Information for your business needs. 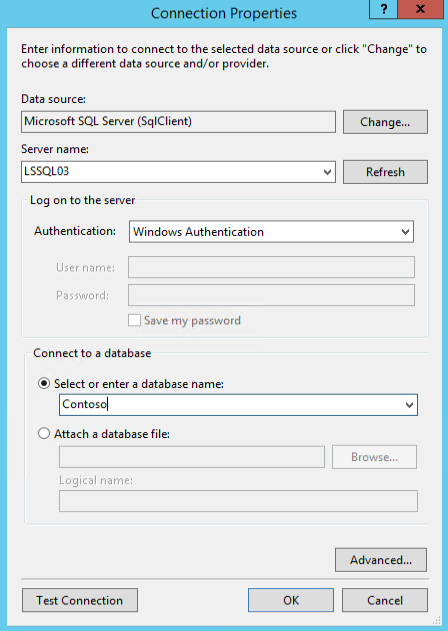 If you use Windows Authentication, it will use the account that the Application Pool you run your Web Services Site runs it to access the Database. (Once deployed). There are multiple other ways to configure it depending on your business needs, but for this demo, we will use Windows Authentication. 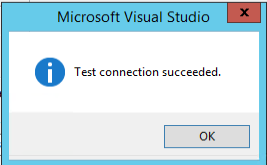 After you configure it, click on Test Connection to make sure that everything is configured correctly. Back to the “Choose Your Data Connection” Page, you will have your connection selected, and you can optionally change the connection setting in the Web Config. 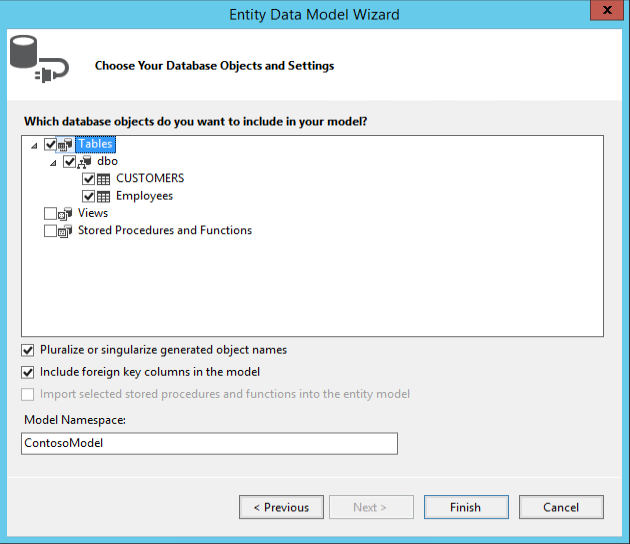 Choose Entity Framework 6.x so we use the latest version available for our project. 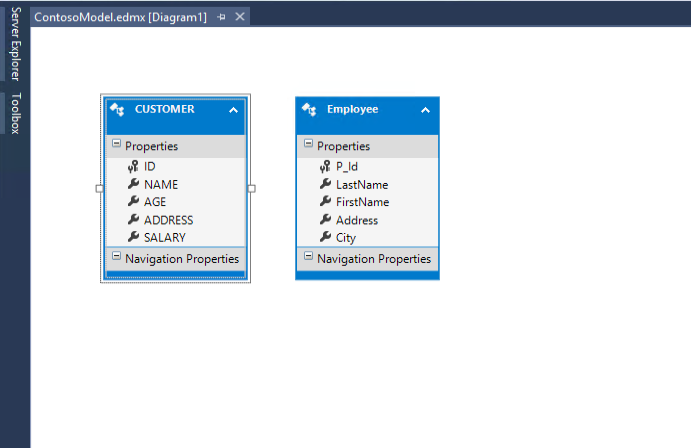 On the next page, choose all the tables that you want included in the OData Service and give a good name to your Model Namespace. After this is done, we need to add another item to our Project! This one is the WCF Data Service, which should be under the Web Tab. Make sure to give it a proper name. 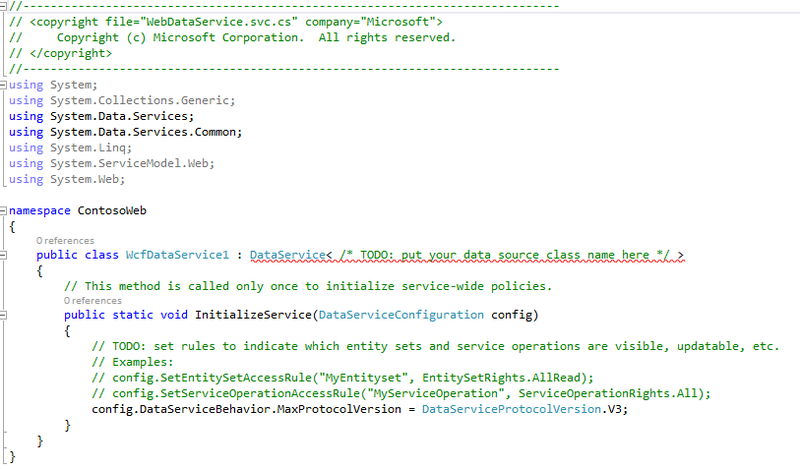 Where we will have to replace it with DataService<ContosoEntities> . 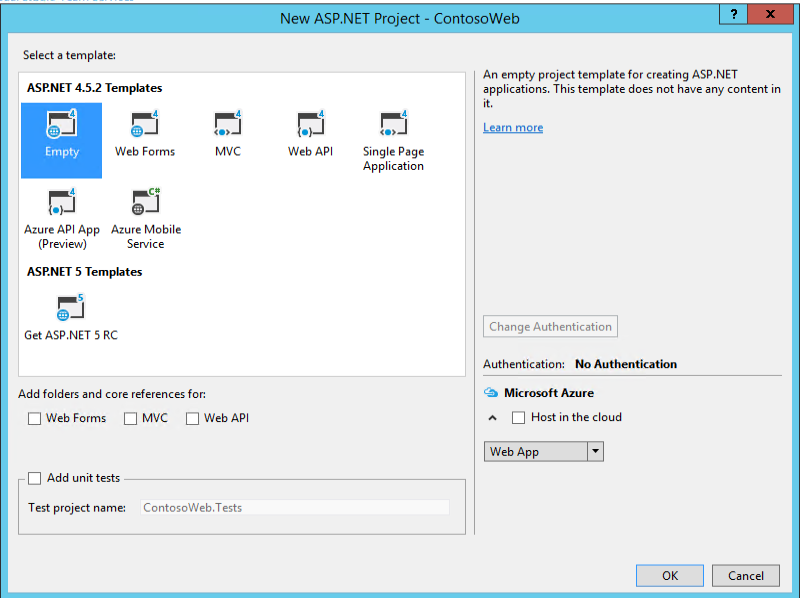 (The connection string we created in Web.Config when creating our connection earlier). However, this will fail. 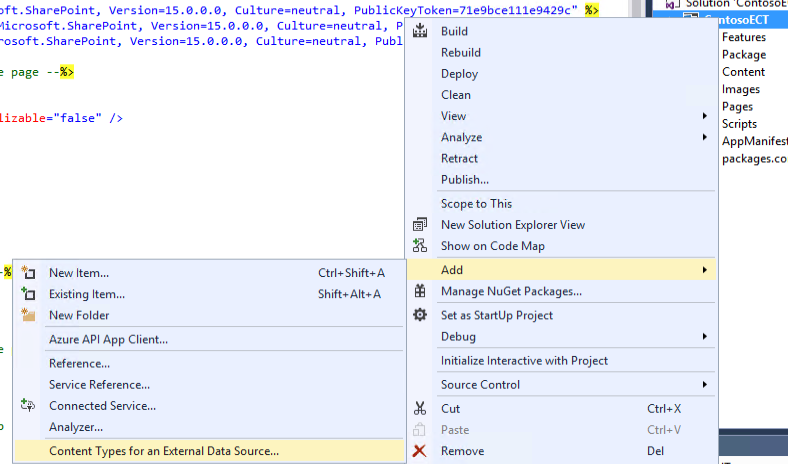 The reason is that, Visual Studio wrongly defaults to using “DataService”, when this will not work with Entity Framework 6. We will need to make some changes! 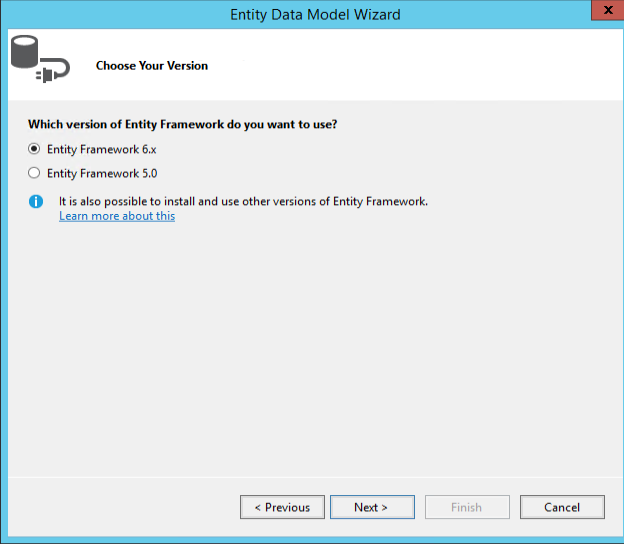 In the Console, run the following command to get the Entity Framework Provider Package “Install-Package Microsoft.OData.EntityFrameworkProvider –Pre”. It should successfully install as seen in the following screenshot. 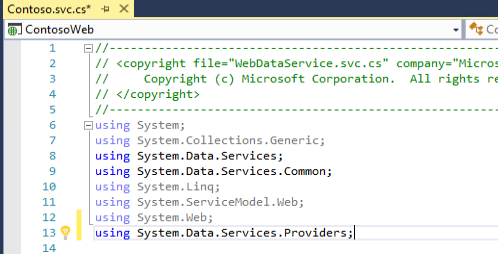 At the top of your file, add the “using System.Data.Services.Providers;” line to load the proper classes. Lower again, in this example, I used the “UserVerboseErros = true”, for debugging, but you can delete that line for production. More important, make sure to do a config.SetEntityAccesRules(“TableName”) EntitySetRights.(rights); . In my case, I gave them AllRead. 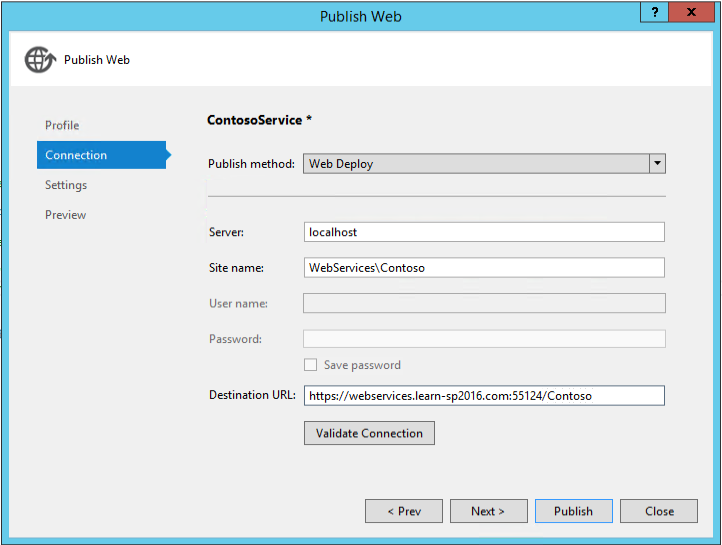 The Project is now ready, so I created a IIS Site called WebServices, as well as an Application called Contoso. 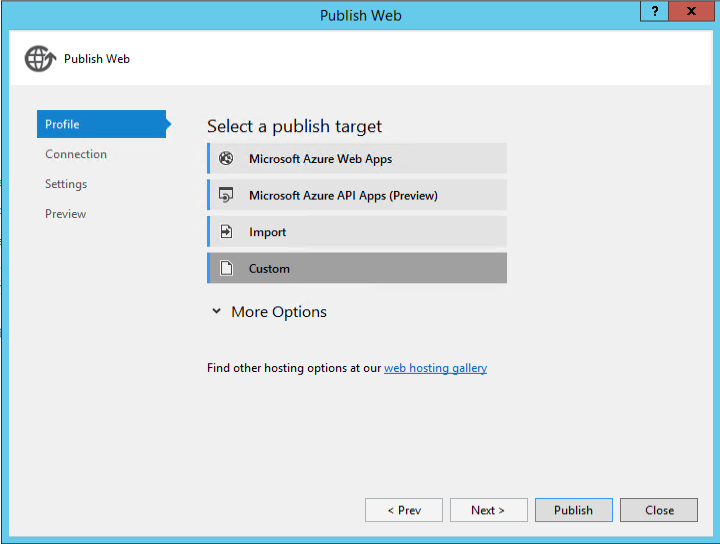 Also enter what the destination name will be, depending on the bindings you use on your IIS Site. Once you click on Validate Connection, you should see a green checkbox that appears near the button. 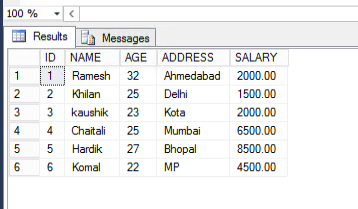 In the Database, select the available Connection String. On the next page, you will see the items that will be deployed, and since it’s a new deployment we will see a bunch of them. Simply click on Publish and it should only take a few seconds. 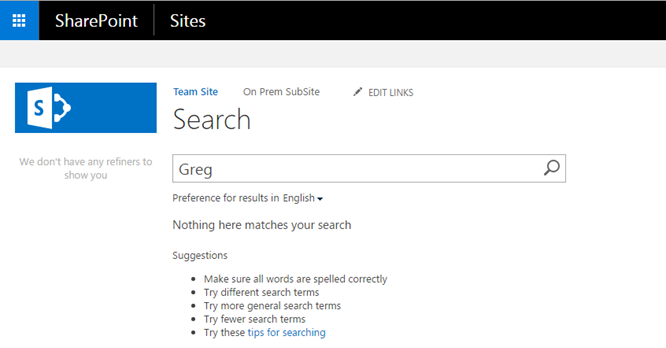 If Everything works correctly, You should be able to navigate to the URL where you deployed your webservice /Servicename.svc and see something similar to this. An XML with your tables inside! Next step, is to go to webservice/servicename.svc/TableName?TOP10 (Tablename IS Case Sensitive!) For example. 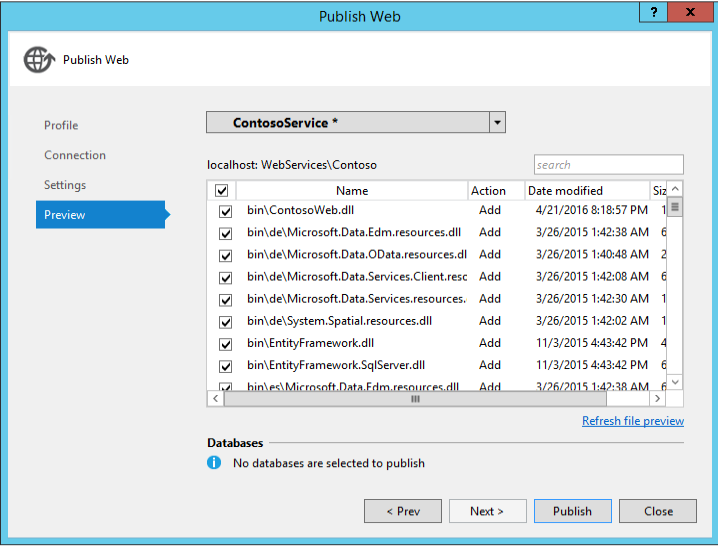 https://webservices.learn-sp2016.com:55124/Contoso/Contoso.svc/CUSTOMERS?top10 . The result will depend on the browser. On IE you will see a RSS Feed Screen, with as you see, 6 results, but we can’t see the results. On Chrome, you will see an XML, and if you look closely, you will actually see the customer data in there! Cool , so our OData Service works, and is able to show data from the SQL Database in the Browser. 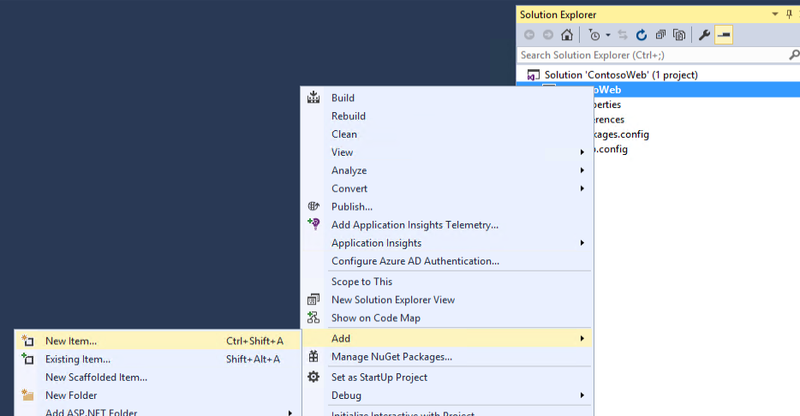 You can now close that Visual Studio solution, and start a new one! 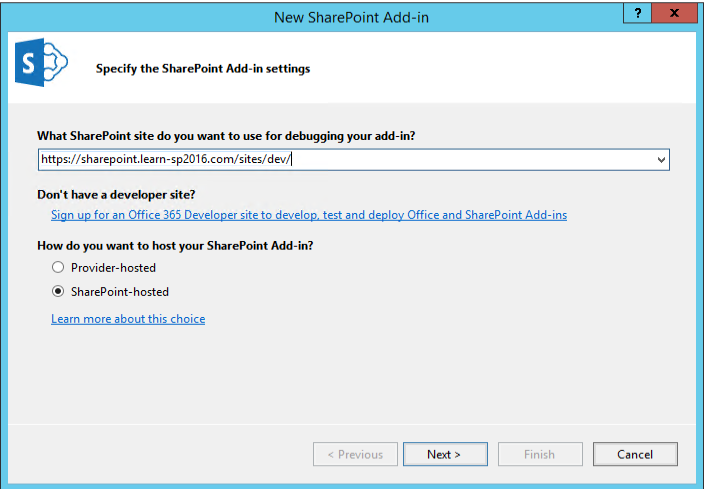 This time, is of type “SharePoint Add-in”. And don’t worry, we will not actually deploy it, so you don’t need to have Add-ins Configured for this to work. You will however need a Dev Site Collection! 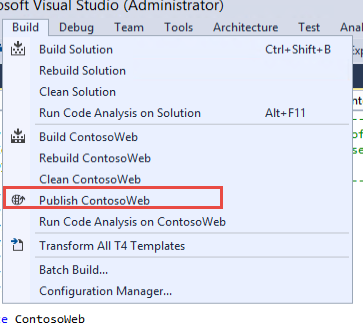 Enter the URL of your Dev Debugging Site, and then SharePoint-Hosted. 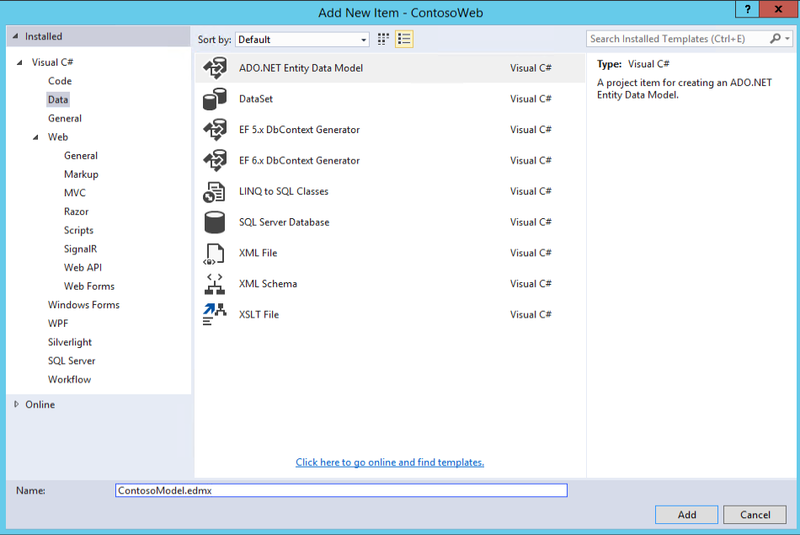 We will now need to add a New Item, Content Type for an External Data Source. And strangely, this is not in the “New Item” pop up as before, but directly on the Add! 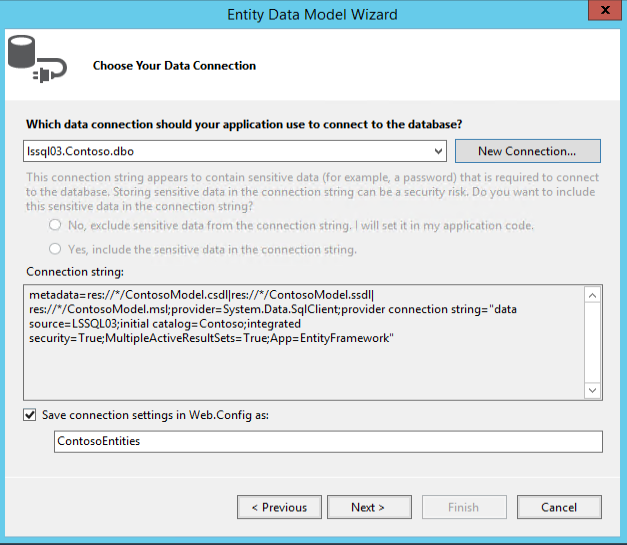 For the OData Service URl, enter the URL to your Service, and give it a name! Select the Table(s) on which you want to create External Content Types and make sure to leave the checkbox at the bottom checked. After this is done, you should have two .ECT files in your Project. 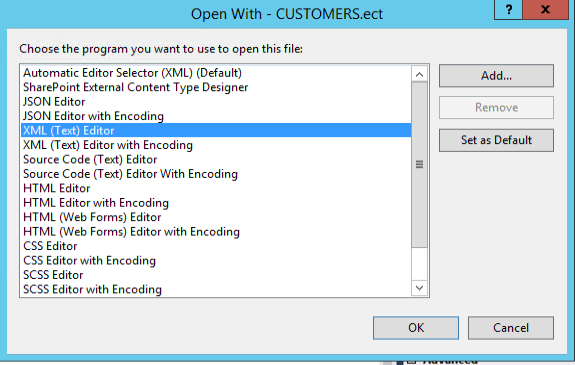 You can then go into Central Admin, BCS Service Application and upload the ECT File. Also, If you didn’t already do it, make sure you have set the permissions! 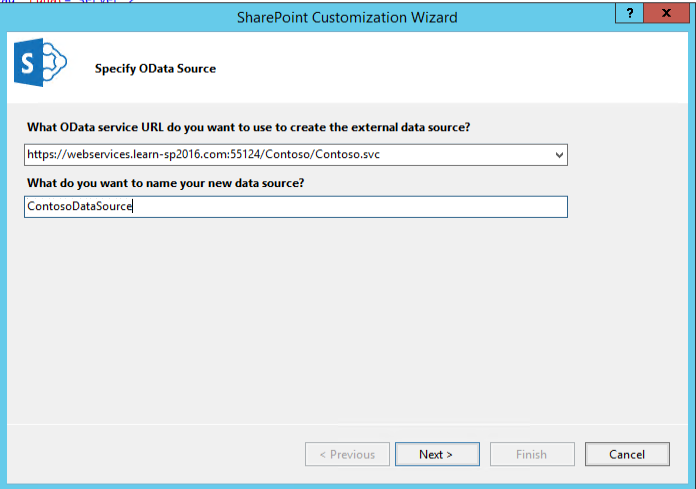 You now managed to show data in SharePoint, by using Business Connectivity Services consuming an OData Source! 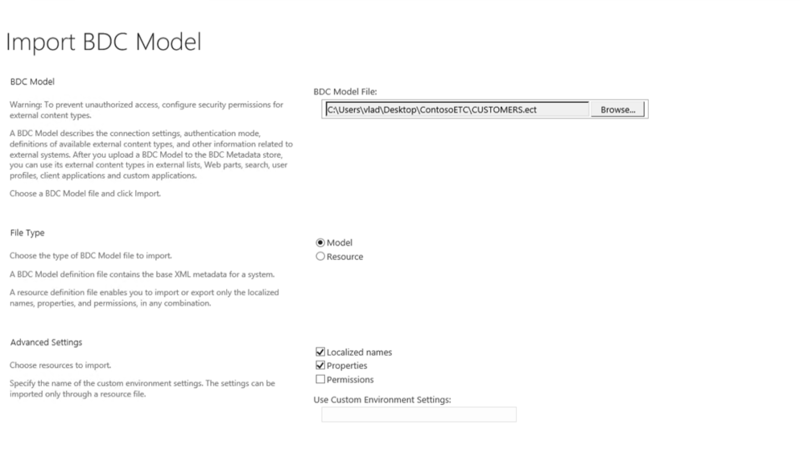 If you want to configure Hybrid BCS , you will need to follow a future blog post that will start from this point. I will link to it once it’s live!